Rembrandtplein (Rembrandt Square) is one of the best venues for going out in Amsterdam. 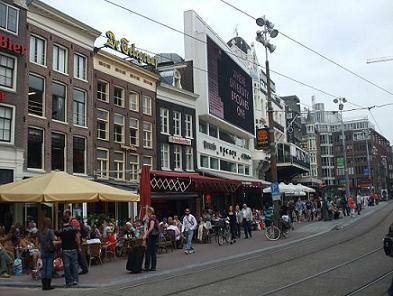 On the square and in the Reguliersbreestraat are lots of cafe’s, bars, restaurants, cinema’s and dance clubs. If the sun is shining, the terraces are packed with people. Rembrandt Square is in the centre of the city behind the Munt Tower at the end of shopping street ‘De Kalverstraat’. 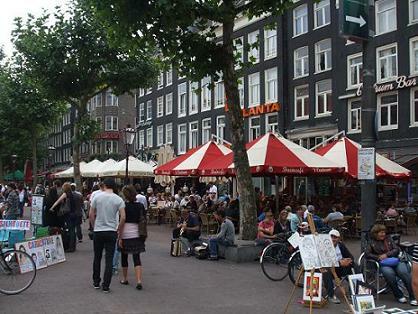 It is about 15 minutes walk to Dam Square and Leidseplein. To Central Station is 30 minutes walking. Close by Rembrandt Square is the flower market, Waterloo Square with the daily flea market, the city hall, metro, opera house. Tram lines to Rembrandt Square: Tram 4, 9, 14. With the tram it’s less than 10 minutes to Central Station. The latest tram from Rembrandt Square (Rembrandplein) to Central Station is around 00.20-00.28 at night. Nightbuses nr355, nr357, nr359 drive all night (about 3-5 times a hour) to Central Station. A cheap property at the square is 1-star Rembrandt Square Hotel. The 22 guest rooms have private or a shared bathroom. The property has 1380 reviews (7.7). Hotel Atlanta has two stars (705 reviews, 6.7). At Rembrandt Square are two 4-star properties from the NH Hotel Group: NH Amsterdam Schiller (1408 reviews, 7.6) and NH Amsterdam Caransa (746 reviews, 7.8). Another 4-star property at the square is Royal Amsterdam Hotel (871 reviews, 7.7). NH Carlton is a popular 4-star hotel at 250 metres from Rembrand Square (3799 reviews, 7.1). Another property nearby with good prices and reviews is 3-star Hotel The Bird (1079 reviews, 8.0).